To shake things up a little bit, we're going to break the tOSU preview into it's parts and spread it out over the course of this week. This way we can add the appropriate amount of hate to each section, and spread the hate around evenly. This year's game marks the 107th meeting all-time for the Wolverines and Buckeyes. Since 1935, this game has been played as the final regular season game for both schools (with the exception of 1942, 1986, 1998). This game has decided the Big Ten champion between these two schools 22 times, and has affected the outcome of the Big Ten title race 25 times. Most recently, the 6-game win streak for Ohio State is their longest streak in the series. Michigan had a 9-game win streak from 1901-1909. Ohio State has won 8 of the last 9 meetings, one of the most dominating stretches of this rivalry. 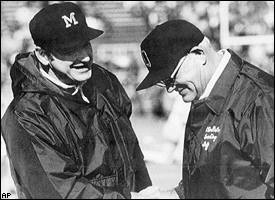 The most famous era for this rivalry, by far, was the 10-year war that took place between Bo Schembechler and his mentor Woody Hayes from 1969 to 1978. Bo won 5 of those contests, while Woody won 4. 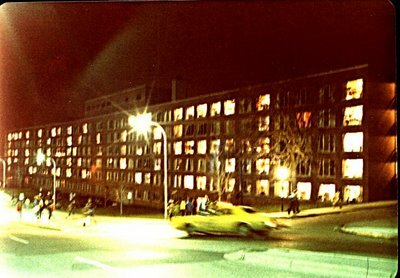 There was 1 tie in 1973, and the Big Ten athletic directors voted to send an undefeated Ohio State team to the Rose Bowl in favor of an undefeated Michigan team. From 1976 through the 1978 contests, Ohio State failed to score touchdown in those 3 games. The most significant game in the series took place in 2006 when both teams entered the contest with 11-0 records. This marked the first time Michigan and Ohio State were ranked in the top two spots in the all overall rankings. While the outcome of that game was significant with Ohio State earning a trip to the BCS Championship game (thanks to a late hit penalty that led to a game winning touchdown for tOSU), the game was overshadowed for Michigan fans by the passing of Bo Schembechler the day before. The loss of Bo had a significant effect on the Michigan team, and more importantly, the coaching staff. Since that game, the two programs have gone in opposite directions. Ohio State has a chance to earn a share of their 6th straight Big Ten title, while Michigan is only bowl-eligible for the first time in 3 years. They always say you should throw out the record book when this game is played, but that has not been the case these last 3 years. Ohio State has outscored Michigan 77 to 20. For the 2010 contest, Ohio State is favored by 18 points by odds makers. Let There Be Light...for Night Games! Does Roy Roundtree Deserve the #1 Jersey?